“Children Need Fats to Be Healthy,” by Jane Sheppard, Well Being Journal, Vol. 23, No. 6. Ignore the hype about low-fat diets—children must have fat in their diets. 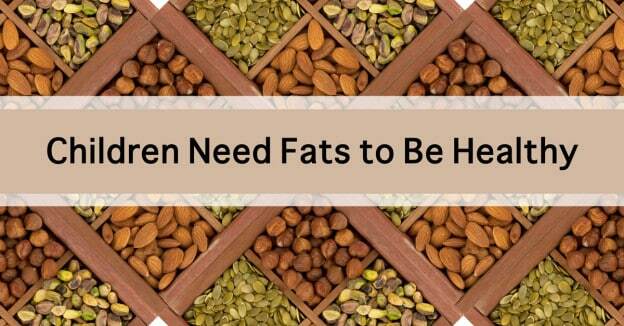 Fats are necessary for growth and provide the building blocks for cell membranes and hormones. Fats are also needed for transporting the fat-soluble vitamins A, D, E, and K. Without dietary fats, carotenes do not convert to vitamin A and minerals are not absorbed properly. Both cholesterol and saturated fat are essential for many body functions, as well as growth and development in babies and children, especially brain development. In fact, mother’s milk contains over 50 percent of its calories as fat, and most of it is saturated fat vital to babies. Avoid foods that have low-fat or reduced-fat labels. These foods may contain harmful ingredients. You’re probably aware of trans fats as unhealthy fats to be avoided. Trans fats are hydrogenated or partially hydrogenated vegetable oils that can be found in margarine, shortening, commercial baked goods, fried chicken nuggets, fish sticks, French fries, chips, and other processed foods. The good news is that trans fats are beginning to disappear from these foods due to label requirements and consumer demand. However, you may want to check labels on processed foods to see what types of fats are used for trans fat replacements. Omega-6 and omega-3 fats are critical to health. These fatty acids must be provided in the diet or by supplementation, since the body can’t synthesize them. Back when processed foods did not exist and meat and dairy came from animals that consumed their natural diets, people were able to get omega-6 and omega-3 fats in roughly equal amounts, and this provided a good balance to maintain health. Now, however, the typical American diet provides about 10-25 times more omega-6 fats than omega-3 fats, leaving people with a fatty acid imbalance that can be pro-inflammatory and can contribute to allergies, infections, and attention problems. The above is an excerpt from the full feature which goes on to take a closer look at the ideal balance of omega fats in children’s diets as well as fats for cooking and baking. Readers may purchase Vol. 23, No. 6, November/December 2014 of the Well Being Journal to continue reading this excerpt.